Sony HT-RT5 review | What Hi-Fi? The Sony HT-RT5 is not your typical soundbar. It’s a hybrid: half soundbar, half surround package. If you want the convenience of a soundbar, but still want proper surround sound with the help of rear speakers, this ‘home theatre system’ is for you. All you need is space to put the kit, and a spare £600. Sony calls the HT-RT5 a 5.1 system, consisting three drivers (a tweeter and two woofers) housed inside the bar, two rear speakers and a sub. The main bar is long and slim, with a sloped front so it doesn’t obstruct the screen. All components are built to a high standard. But the HT-RT5 isn’t as neat a solution as a straightforward soundbar. You still need to find space for the two compact rear speakers, which connect wirelessly to the main bar and need to be plugged into the mains (unlike those of a Philips Fidelio B5). The same goes for the rather large subwoofer. Sony helpfully provides an auto-calibration set-up and mic with the system, so you can get the best possible surround sound from the HT-RT5 – just like you would with a traditional speaker package. Make sure the rear speakers are placed equidistant from the bar, and the calibration will sort out the rest. It’s quick and accurate, and you can tweak the speaker settings manually in the menu. Once calibrated, play the Mad Max: Fury Road Blu-ray and let the HT-RT5 roar into life. The soundbar delivers detail with clarity and speed, with each utterance and guttural sound effect crisply conveyed. It’s fast, attacking and refined. But that’s where the good news stops. There’s little weight or punch to the Sony’s performance. It’s too thin, with the midrange needing more solidity to convince. With music, that disconnection between the treble and bass is more pronounced, despite the clarity and subtle detail. The top end is thin and hardens up easily, leaving you with little natural warmth or enjoyment. More worryingly, there’s little sense of any cohesion between the channels because of poor integration between the speakers. The HT-RT5 doesn’t spread sound wide enough, leaving a huge gap between soundbar and the rear speakers. There’s decent control over the dynamics, with quieter moments making their mark against the thunderous action. But we want more authority to underpin that insightful detail. Sony has taken pains to ensure the HT-RT5 has everything you need for a cinematic experience. It offers a generous three HDMI inputs and one output, which all support 4K passthrough and DTS-HD and Dolby TrueHD soundtracks. A single optical output is also available. 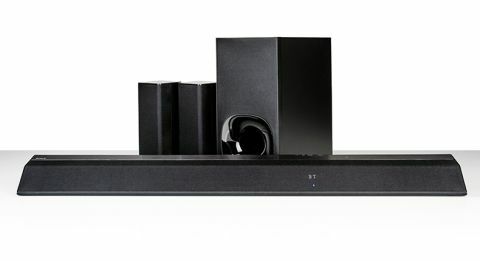 The HT-RT5 uses Sony’s own LDAC codec for higher quality streaming over Bluetooth (instead of the more popular aptX), while the soundbar also features NFC, wi-fi and ethernet, Spotify Connect and support for Google Cast. It can also be part of a multi-room system, using the SongPal app to link other Sony products together. Sony deserves credit for its remote control. The slim wand is instinctive to use, with buttons that are responsive and logically placed. But those extensive features don’t make up for that disappointing performance. Despite Sony’s intentions, the HT-RT5’s thin, hard sound isn’t exciting or engaging, and those rear speakers fail to deliver on the promise of true surround sound. They also make the HT-RT5 a clunky system; you might as well opt for a full 5.1 speaker package if you have enough space for this system’s components. There are alternatives, such as the Philips Fidelio B5, that do the job better. It’s £50 cheaper, too. Sony’s HT-RT5 may have refinement and clarity, but the lack of engagement and an insubstantial sound means that it can’t justify that premium price tag.